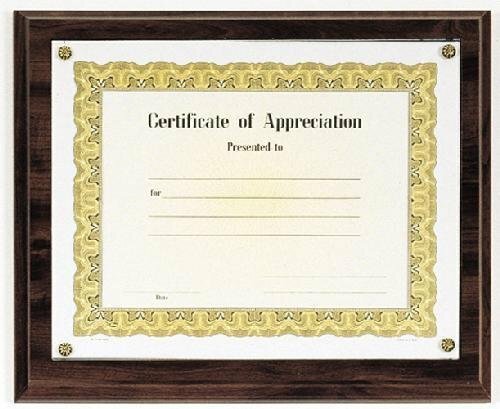 Need to give a certificate in a frame? Our collection of certificate plaques and certificate holders are perfect. Award Plaques are traditionally the most popular way to recognize achievement. FREE Shipping is provided on orders of business awards over $100. FREE Engraving is included on each business award. This cherry finished certificate plaque includes a protective plexiglass cover. The plaque has an 8-1/2" x 11" area that is routed out to fit the certificate in. If you provided the completed certificates, we will be happy to mount them for you. Otherwise, you will need to mount the certificate on the plaque with the included decorative nails. NO engraving is provided for this product due to a lack of space. FREE Shipping is provided on orders of corporate awards over $100. FREE Engraving is included on each corporate award. 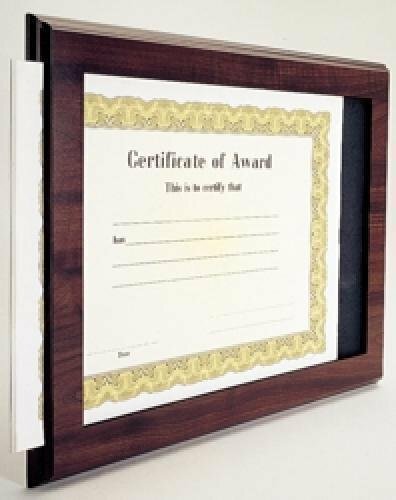 This cherry finished certificate plaque slide-in includes a protective plexiglass cover. An 8-1/2" x 11 certificate slides into a slot on the edge of the certificate plaque. No engraving is provided for this product due to a lack of space. No engraving is provided due to a lack of space. FREE Shipping is provided on orders of corporate awards over $100. FREE Engraving is included on each corporate award.